Angora probably has no idea that what she’s doing is incredibly annoying to everyone around her, especially when they’re slogging through the mud and she has to keep taking breaks to let them catch up… check your height privilege, folks. Apologies for this page being 12 hours late!! Had an act of god Cintiq issue drop on me last night unexpectedly. Pretty sure I know how to fix it, and don’t forsee any other delays. Whoa, that bonus art page is really neat and kinda insightful. “Naked page”. Yeah. Just like I figured. But yeah, interesting insights into the art process and all that, why not. All in all, it may as well be less tiring than splrtching through the mud. I doubt he minds, after all he did call Luca a “monster” several pages back. The bonus artwork really shows us how perfectly you capture lighting. Wow, do those look lifelike. Like beautifully executed impressionist paintings. You’re so good at this. Love the comic, keep up the great work! I read this comic for a while up until your hiatus, before removing it from my “weekly comic check” folder. Then I unknowingly picked up Mare Internum when you started it, and was totally hooked from the get go and have been checking it every week. Now I find why your art style on Mare seemed so familiar, and you’ve started updating again! So excited for more, and I hope to be able to join your patreon soon! Haha, yay XD Thanks for checking out MI, and I’m glad you found The Meek again :] I’m really glad to be updating both comics regularly! I’ve just gotta say how much I adore Pinter’s facial expressions (and, well, everybody’s,) but Pinter’s face has something especially Pixar-like about it. All of this looks great, is what I’m getting at. And also how amazing a Meek animated movie would be. Gah. Well, we can hope. Oh my gosh. I love that naked page! It has that matte feel to it. Interesting to see how a comic progresses. How do you go from the hazy feel of that level and get to the sharp images we see in the comic itself? 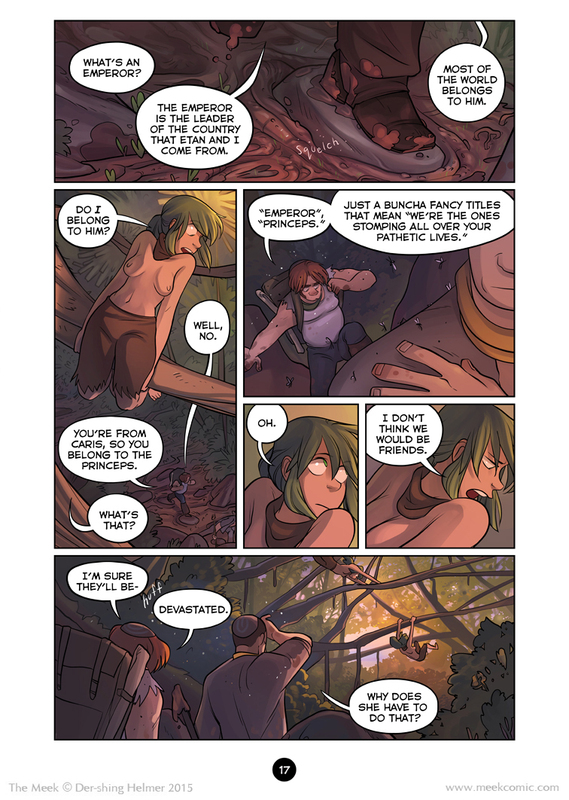 That’s pretty much the entire finished page… I just turned off all the lineart and text layers. Those make a huge difference in perception. And, once you shrink it down it gets a bit more crisp. I am so sorry, I’ve been resisting that pun for weeks, I couldn’t take it anymore.